CW, as stated in the first post about Cluster Genealogy, has had every possible DNA test one could have. So one of the first things I did was look at his surname DNA project and his results as compared to others who match him closely. Using cluster genealogy I am working with CW on a Paternal line brickwall – SW (Samuel). To help break down this brick wall CW has taken DNA tests – all of them. 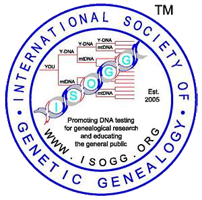 The Autosomal DNA Results information is a good place to look at relationships back to any of his 64, 4th great grandparents (we all have 64, 4th Great grands).